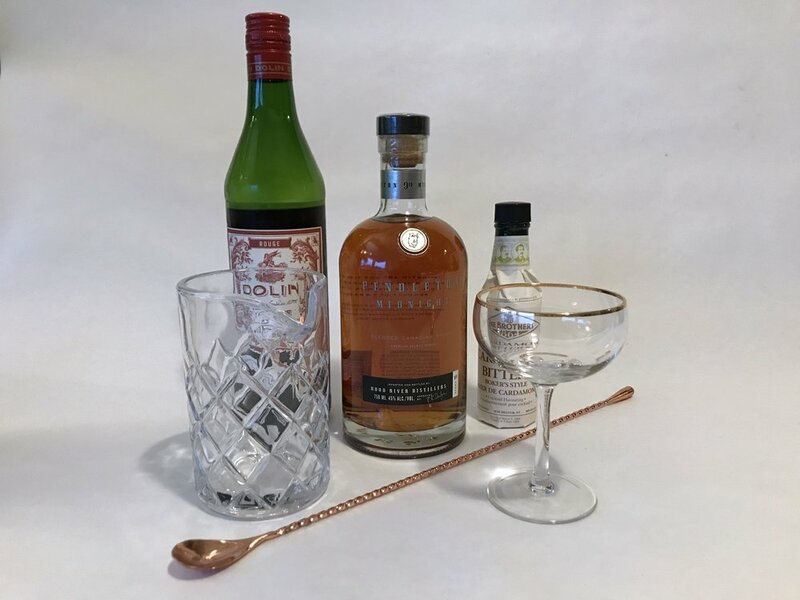 While Natalie was sipping on her Pendleton® Midnight across the country in Oregon, I was in New York, sipping on my own dram of Midnight, and thinking that I’d be remiss if I didn’t try it out in my all-time favorite cocktail to experiment with: a Manhattan. After all, us east coast city girls need to have our own passions to keep us busy without any rodeos around! In sipping the spirit, I got a lot of the same tasting notes as Natalie - vanilla, cake batter, a hint of baking spice - so I wanted to opt for a creative variation of a Manhattan that would highlight these tasty flavors. That said, a Manhattan isn’t the easiest drink to experiment with, since the three-ingredient list limits what you can do with it. With the whisky already decided (Pendleton® Midnight) and the vermouth determined by what I had on the bar (Dolin Rouge) the only variable I could play with was the choice of bitters. My first personal foray into the transformative power of bitters (beyond the numerous concoctions served to me by talented bartenders) was actually with Natalie a few years ago. We were visiting the Museum of the American Cocktail (highly recommend! ), inside the Southern Food & Beverage Museum in New Orleans, where I discovered Love Potion No. 9 bitters, an herbal, floral blend that I carried around in my purse for the rest of the vacation to gussy up my $4 happy hour vodka sodas. Since then, I’ve been on a bitters kick, collecting all kinds of interesting flavors beyond your standard Angostura and Peychaud’s (both preferred for a classic Manhattan). Enter Fee Brothers Cardamom Bitters, the perfect complement to the baking spice notes in the Pendleton® Midnight. Topped off with an authentic Amarena Toschi black cherry, it was the perfect cocktail for this Manhattan girl. Combine ingredients in a mixing glass over ice, and stir gently for a minute or so. Strain into a chilled coupe. Garnish with a cherry or two.